When asked to review Homeschool Legacy's Once-a-Week Series unit study We the People: Getting to Know Your Constitution, by Sharon Gibson, I was very interested, because I knew the need was there for Adam(14) and Kaden (12) to learn more about our goverment and it's beginning. When I learned that completing the unit study would also satisfy all requirements for Citizenship in the Nation, a challenging Eagle-required Boy Scout merit badge, I was more than interested. This unit study, and many others in this Once-a-Week series, meet not only Boy Scout merit badge requirements, but also American Heritage Girls and 4H requirements. Information about what requirements will be met in the unit study can be found on the Homeschool Legacy's website and specific requirements being met are noted with symbols throughout the unit study. The Once-a-Week unit study is completely downloadable, an easy single digital download that you can then print to use. I printed the 68 pages and immediately put them in a 3-pronged binder. This unit study is an 8 week program, with a different chapter devoted to each week; the Declaration of Independence, the Constitution, the amendments to the Constitution, and the different branches of government. It is suggested that the user do parts of the unit study a few days a week, devoting one entire school day per week to doing the majority of the unit study. Fortunately, the program is very flexible because that wouldn't have worked for us, there's no way we could devote an entire day just to one subject - instead we did a little bit each day, completing the weeks work in 2-3 weekdays, putting in about an hour each day, with additional time spent reading and watching related movies. At the beginning of the unit study is a page outlining possible schedules for completing the unit study, and at the back of the program are four pages devoted to getting the most out of the unit studies; both of these sections are very helpful. When We the People: Getting to Know Your Constitution was first presented to me I was aware of the fact that it was a Christian based program, the premise of the unit study is to understand the Christian values and beliefs that our founding fathers possessed and the role those beliefs and Christianity played in the founding of the United States of America, particularly the writing of the Declaration of Independence, the Constitution, and the Bill of Rights. The kids and I don't home school from a religious perspective, but I do believe that our country was founded by men with a strong belief in God and very admirable values, and that that is important to understand and remember as our country grows and changes. One of the benefits of a unit study like this is the flexibility to adapt it to meet the needs and style of the student, which we did; we followed the majority of the unit study but omitted the bible work. Chapter 3 is about the Bill of Rights. Each boy was asked to read the first ten amendments to the Constitution (the Bill of Rights). We then learned about the "separation of church and state" which does not appear in the Constitution, as many believe, but was coined after it was said by Thomas Jefferson and referred to keeping the government out of religion, not to keep religion out of government. In Chapter 3 the boys were asked to read a newspaper daily for a few weeks, which satisfies a Citizenship in the Nation requirement. The boys also learned about felonies and what rights a felon loses. Gathering and writing about this information was their creative writing schoolwork for one day. We discussed the reasons for the Bill of Rights and how it came to be necessary. Throughout each chapter are numerous reading opportunities, with options for both strong and less confident readers. I appreciated how thorough and clearly written this program was. It was very easy to grasp what the author was saying and where she was leading, and the boys learned a great deal from this program. I really enjoyed studying the Constitution with the boys because there were constant opportunities to think and discuss. While we could do the unit study work in an hour or so we often sat at the kitchen table discussing the founding of our country, comparing it to the way our country is running today. I have to admit that I'm not normally a fan of unit studies. I often find them cumbersome and confusing. I felt that this program was easy to follow and easy to teach, and I actually liked teaching it. The program is biblically centered. I think this can be a positive or a negative, depending on the user, but as I said before we were able to adapt the parts of the unit study we needed to while still teaching many very relevant religious portions. Would I teach this to our troop for their merit badge study? Yes, I would with a few alterations. Would I recommend the unit study to other students studying American history and the United States Constitution? Yes. 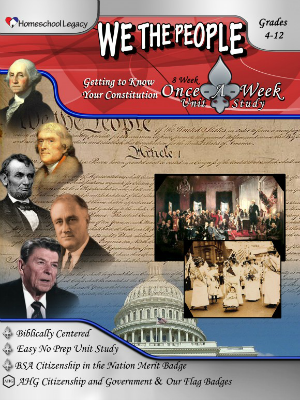 We the People: Getting to Know Your Constitution is geared towards kids in 4th through 12th grade and it, along with many other unit studies, is available at Homeschool Legacy.